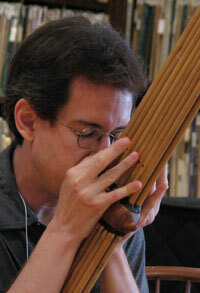 The khaen (pronounced "can" and sometimes also transliterated as 'khene') is a bamboo free-reed mouth organ and relative of the Chinese sheng and Japanese sho. It is considered by the Lao people, who generally live in lowland Laos and Northeast Thailand, to be the predominant traditional musical instrument and symbolic of Lao identity. It is also played by some of the upland and minority ethnic groups in Thailand, Laos and Cambodia. Learn more about the khaen tradition in this short article for the Center for World Music. I began research the traditional musics of Thailand in 1994, after encountering them at the Smithsonian American Folklife Festival in Washington, D.C. The instruments on which I have concentrated are the khaen and the ranaat ek, the principle xylophone of the Thai classical tradition. I studied khaen with Molam Ratri Srivilai in Khon Kaen, Northeast Thailand and Jarernchai Chonpairot in Mahasarakham University, and ranaat ek with Ajarn Panya Roongruang, of Kasetsart University. I also studied music and Thai language at Wat Thai, D.C. in Washington D.C. I have taught Thai music at the Thai Buddhist Temple of San Diego, and have been a Visiting Professor at Mahasarakham University in Northeast Thailand, and I have lectured at Mahidol University and Kasetart University in Bangkok about my compositions for Thai instruments. I am now considered in Thailand to be among the finest players of traditional khaen music, which is unfortunately in serious decline as Northeast Eastern Thailand has rapidly modernized. I have composed solo and ensemble works for the khaen which build on the foundation of traditional techniques and musical principles and extend into the contemporary Western idiom. 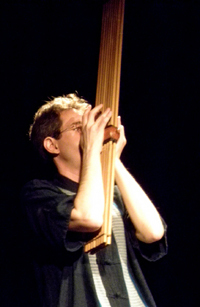 I have also collaborated with Marcelo Radulovich (hurdy-gurdy, post-production), Charles Curtis (cello) and Scott Walton (contrabass) as Gunther's Grass, to explore drone-based improvisation on acoustic instruments (hear Gunther's Grass on the CD Never in the Future That Dawned Earlier On). In order to promote the khaen as a concert instrument and develop new repertoire, I am soliciting new works from composers. To aid composers unfamiliar with the instrument, I have prepared a brief guide which may be freely downloaded and shared. A newly revised version from August, 2009 is available now. DOWNLOAD KHAEN GUIDE FOR COMPOSERS. In Spring, 2011, I presented a solo khaen recital New Musical Geographies, at various locations in the U.S. The recital featured a number of works written for me, including new pieces by Jeff Herriott, David Loeb, Matthew Welch and Sidney Marquez Boquiren. I have presented versions of this recital in the U.S., Singapore, Thailand and Malaysia, including at the Thailand International Composition Festival. In November, 2017, I debuted a second New Musical Geographies recital, with new compositions by Yu Kuwabara, Vera Ivanova, H. James Harkins, Sidney Marquez Boquiren and myself, and including arrangements of Swedish folk tunes for fiddle, khaen and harp. The recital is archived on youtube. The following are modern compositions for the khaen which I am currently performing. On the left is Somaun Noi Lomboon, one of the finest khaen players in Northeast Thailand, performing at his home. Below is Changkhen Somjinda of Baan Sii Kaew, Roi Et Province, widely recognized as one of the best khaen makers. He uses traditional tools to make instruments, including the elephant leg bone in the foreground.